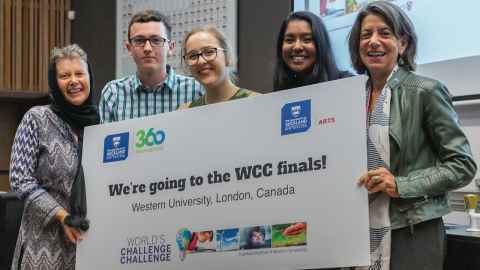 March 20 saw six teams of University of Auckland students competing in the local final of the World’s Challenge Challenge, a global initiative from Western University in London, Canada. In 2015, the United Nations put forward a list of new Sustainable Development Goals – 17 important targets for issues such as poverty, food sustainability, clean energy, climate action, education, technology and infrastructure. Just this month, Times Higher Education ranked the University of Auckland number one in the world at delivering these goals. The World’s Challenge Challenge (WCC) encourages students from around the globe to work collaboratively on innovative solutions to problems relating to the Sustainable Development Goals, and helps them develop their academic, oral presentation, and entrepreneurial skills. At the WCC Auckland event, second-year Global Studies students came up with creative solutions for their chosen global problem. 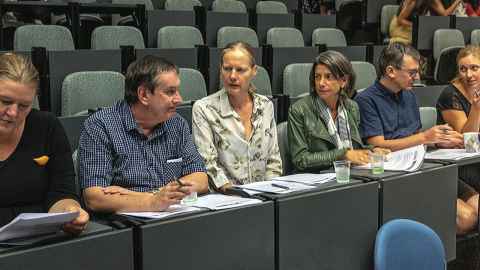 After a moving welcome and karakia acknowledging the recent tragic events in Christchurch from Dr Hilary Chung – founding Director of the Global Studies Programme – the teams gave articulate presentations to their peers and a panel of academic and community leaders. The winning team, called ‘Loyal Trees’ and made up of students Henry Frear, Arianna Bacic, and Ishie Sharma, proposed a carbon offset loyalty programme to promote ethical purchasing and address the issue of climate change. Their solution included an app for customers to accrue points with participating retailers, which could then be redeemed for the planting of trees to offset personal carbon emissions. This is the first year the University of Auckland has taken part in the World’s Challenge Challenge. Participation in the competition is fabulous preparation for the Bachelor of Global Studies and showcases what our ethos is all about. Arianna, Ishie and Henry will travel to Canada in June to compete in the global final for a chance to win CAD$30,000 to help further develop their proposed solution and support implementation. They will have the opportunity to network with some of the best and brightest students from around the world, participate in academic events, and generate further discussion around global issues. We wish them the best of luck!